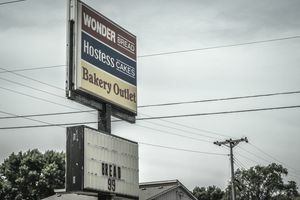 Wonder Bread/Hostess The company no longer maintains it's own bakery thrift store locations. In 2014, Big Lots became the official bakery thrift store for both brands. Go here to find your nearest store. Your local Dollar Tree locations. They get bread from Bimbo, Arnold and Flower's, so you'll find brands, like Cobblestone, Nature's Own, Wonder, Sunbeam and Thomas for just $1 each. My local stores get bread deliveries three times a week, and it sells out fast. Ask an employee when they get their bread, so you get first dibs. A fun thing about buying your bread at the Dollar Tree: they accept coupons. Save up all your bread coupons, and you could get your bread for as little as $.50 a loaf. Sometimes there are even coupons that make it free! On several occasions, I've found $1 peelie stickers on the loaves of bread. Since Dollar Tree will accept four like coupons per day, that's four free loaves of bread just for taking a second to peel off the coupons and hand them to the cashier. When you shop at a bakery outlet store, you'll find everything from loaves of bread to buns, bagels and snack cakes. But don't count on the things you see on the shelves this time to be there the next time you go. If you see something you want, it's best to stock up while you can. Bread freezes beautifully, so you don't have to worry about using everything up right away. If you think you'll use something within a month or so, just toss it in the freezer as is. If you think it'll take you longer to use something, take a minute to wrap it better, before you toss it in the freezer.